While astronauts like Tim are on the International Space Station (ISS), they experience 15 or 16 sunrises and sunsets every 24 hours. Tim will need to work and sleep according to a daily schedule, which includes a regular eight-hour sleep at the end of each mission day. To help him to sleep, he may wear eyeshades or pull down shutters over the windows to keep out the sunlight. Human beings have been programmed for millions of years to operate on a 24-hour cycle, because that is roughly how long it takes for the Earth to rotate on its axis. We have developed a natural rhythm of sleeping while it is dark, and staying active and awake during daylight hours. These rhythms of waking and sleeping are called our circadian rhythms and they are hard-wired into our brains and bodies. According to some astronauts, orbit is one of the most comfortable places to sleep. Without the effect of gravity acting on their limbs, the astronauts are able to fully relax. Their arms relax and float up in front of them, so the sleeping crew often look like zombies. However, astronauts could easily drift around while sleeping on the ISS, which could cause injury or damage equipment. The solution to this problem is beautifully simple: their sleeping bags are fixed to the wall. Canadian astronaut Chris Hadfield shows how astronauts sleep in space. After a day's work, astronauts retreat to their private quarters, which are very compact – it’s more like a large cupboard than a room. In this small space they can store personal items, use a laptop to access the internet and float to sleep in their sleeping bag. The tight space means astronauts need to keep their pod tidy and organised. When they’re not being used the sleeping bags are rolled up and kept out of the way. 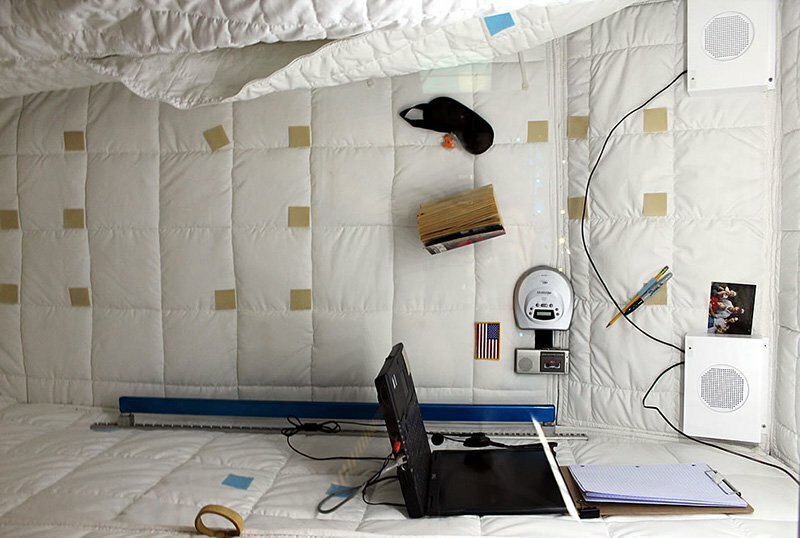 An astronaut's sleeping quarters aboard the International Space Station. Your room at home is probably bigger than an ISS sleep pod but it would make a great place for a space-themed sleepover, especially when the Soyuz rocket launches in December with Tim Peake on board. How many crew members could you fit in your room? You need to be able to sleep comfortably and, unfortunately, due to gravity, you need to sleep lying down. Arrange your room so that you can fit all crew members’ sleeping mats extended on the floor. The more cramped the space, the more realistic it will be! Use the cardboard boxes to create ‘dividers’ so that each member of the crew can create their own area for their sleeping masks and other items they might need. Arrange the sleeping bags alongside the dividers and on top of the camping mats with the zips open and face up. Stick velcro pads on your book, eyeshade, toothbrush and anything else you need near bedtime. Attach these to your cardboard divider so that they will be close at hand when it’s time to sleep. Then each crew member rolls up the camping mat and sleeping bag together so it is out of the way, just like astronauts do every day. Don’t allow your crew any Earth ‘luxuries’. No open cups, only drinking pouches with straws. And no running water; see if you can get clean the ISS way: by squeezing water on a facecloth and wiping yourself clean with it. Be sure to stock up on some freeze-dried camping rations from your nearest camp shop or army store. These are the closest thing you get to the food eaten on the ISS and will add a whole new dimension to midnight snacks. When it comes to bedtime, unroll your sleeping mats and bags, climb into your bag and zip up to your armpits, leaving your arms free to read. When it’s time to sleep, put on your eyeshade.